What we are seeing at the Gaza border is a carefully orchestrated strategy by Hamas. To some degree the terror group will view the death toll and international condemnation of Israel as a success. Thankfully they have failed to breach the border. 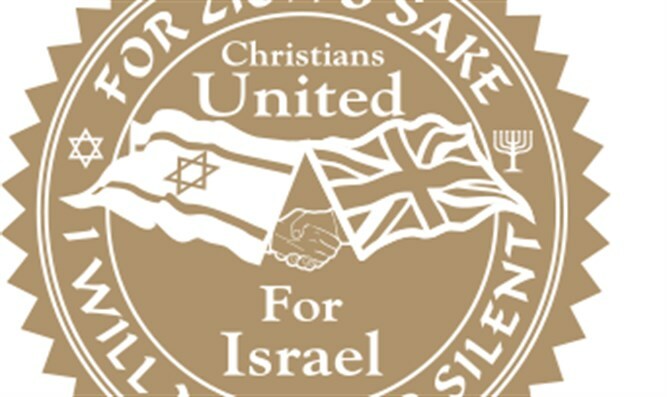 The purpose of Christians United for Israel is to provide a national association through which churches, ministries and individuals in the United Kingdom can speak and act with one voice in support of Israel in matters related to Biblical issues as well as fight anti-Semitism..
Reposted with permission from UK Christians United for Israel (CUFI). What we are seeing before our eyes at the Gaza border is the rolling out of a carefully orchestrated strategy by Hamas. To some degree the terror group will view this week’s death toll and international condemnation of Israel as a successful campaign. Thankfully they have failed to successfully breach the border. Meanwhile, politicians and the media are echoing the Islamist group’s narrative, whilst carelessly portraying the riots as “spontaneous” protests to President Tump’s US Embassy move, rather than well-organised, well-funded, planned acts of aggression. Hamas, which calls for the destruction of Israel, has been leading a series of protests for the past seven weeks under the “March of Return” banner, a $10 million Hamas-led campaign attempting to breach Israel’s security fence and demonise Israel in the process, regardless of the cost to human life. In March, CUFI explained that the protests would take place every Friday and would culminate with “decisive” action on Tuesday, 15 May, which the Palestinians observe as Nakba Day, meaning “Day of Catastrophe.” The protests are also set to continue on the first Friday of Ramadan, which begins this week also. Hamas is violating both human rights laws and also violating international law for its act of aggression and attempts to forcefully enter a Sovereign nation. In this article we explain the truth about what is really taking place at the Gaza border. This is proof that the death toll, which some sources estimate at 60, shockingly serves the tactics of Hamas. Hamas leader Yahaya Sinwar urged followers the other week, “We will take down the border and tear out their hearts from their bodies”. Amid Antisemitic and "Death to Israel" Chants, Hamas Political Bureau Chairman Ismail Haniyeh Vows: We Shall Never Recognize Israel - Scenes from Gaza "Return March"
Hamas social media channels are encouraging rioters today to take “knives and guns” with them and to “kidnap Israeli citizens”. They have even circulated maps showing the shortest distance to reach Israeli communities after breaching the border fence (see video below). Hamas is paying protesters $100 each simply for taking part in the protests. They receive more if they are injured, and families are compensated by Hamas if anyone dies. Israel tried to counter this incitement Monday morning by dropping thousands of leaflets on the protesters urging them to not participate in “Hamas’s life-threatening farce”. Hamas has no concern for the lives of ordinary Gazans. Lorry shipments of supplies for Gaza have been unable to enter through the Gaza border crossing Kerem Shalom for two days after being set ablaze (the third time this month) by Palestinian rioters. The arson also destroyed the only fuel and gas pipelines that serve the Gazan people. Today medical supplies were able to enter, but Hamas blocked entry to hundreds of humanitarian supplies, including food. We know that throughout all these riots and protests more than 80% of those killed have belonged to terrorist organisations. We saw this again yesterday as three Hamas-members were killed as they planted an explosive device on the border fence. The IDF has reported that so far 24 of those killed have been identified as belonging to the Hamas or Islamic Jihad terror groups. Yesterday 10 explosive devices targeting Israelis were detonated during riots at the Gaza-Israel border; gunfire was reported on at least 3 occasions; 17 kites carrying firebombs were dispatched into Israel, igniting 23 fires, according to Channel 10. It is important that we understand these protests for what they are. They are not peaceful and it is not the Israeli army against civilians. It is Hamas terrorist fighters using women and children as human shields in order to carry out attacks against Israeli troops and the border fence, with the end goal being that they can break into Israel and kill Israeli civilians. As seen in the video below released today, even this senior Hamas official says this is NOT peaceful resistance and the “deception” does not fool the Palestinian public. He also confirms the use of civilians as human shields for terrorists when he says it is “peaceful resistance bolstered by a military force”. Israeli military spokesman Lt Col Jonathan Conricus says the army has bolstered its front-line forces along the border, but also set up additional “layers” of security in and around neighbouring communities to defend Israeli civilians in case of a mass breach. He said there had already been several “significant attempts” to break through the fence. Israel has made it clear to Hamas that if their terrorists actually break through the border in any way then Israel will target military facilities within the Gaza strip. These violent riots are happening just outside of Israeli communities. How would you feel if this was in your backyard? 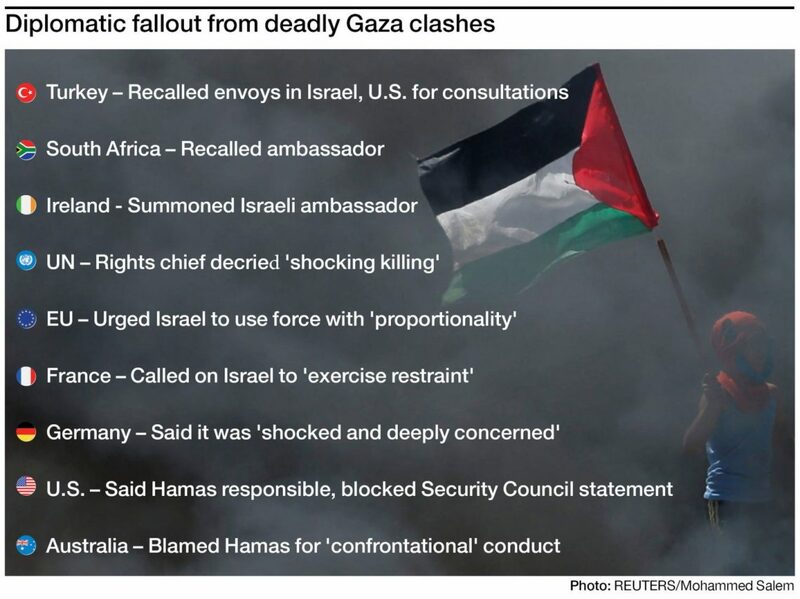 Many world leaders and the media are aligning their narrative with that of Hamas. Meanwhile, Ireland has today recalled its Ambassador, however, the US and Australia have rightly condemned Hamas. Turkey meanwhile has this afternoon expelled Israel’s Ambassador to the country. The UK Government has called for an independent investigation into the violence. In a statement, the spokesman for the UK Prime Minister said the Government was “extremely concerned” by the scale of the violence, describing the loss of life and injuries to the Palestinians as “tragic”. MUST WATCH-This question from @PM4EastRen and response by @AlistairBurtUK just now during question on Gaza in Parliament shows just why recent events are not all that are being portrayed by those who's only aim is to attack the Jewish state! Alistair Burt told the Commons today that the tragedies should be used as “an opportunity for a springboard to peace”. Mr Burt was asked by the SNP’s shadow international affairs spokesman, Stephen Gethins, if he agreed with comments made by Foreign Secretary Boris Johnson that the embassy move is a “moment of opportunity for peace”. Mr Burt said the British Government did not agree with the embassy move. "Erdogan is among Hamas's biggest supporters and there is no doubt that he well understands terrorism and slaughter. I suggest that he not preach morality to us." 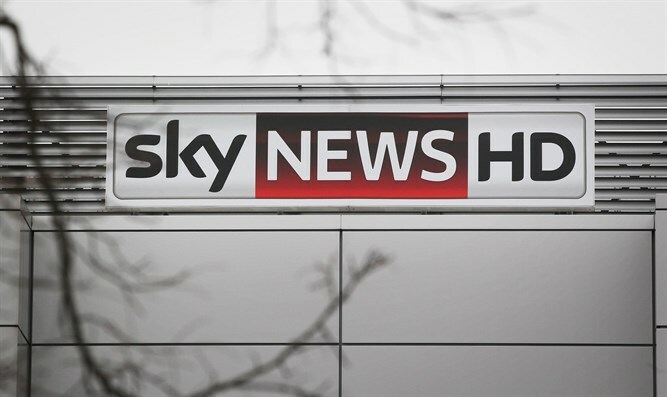 Sadly, and unsurprisingly, the mainstream channels in the UK have been demonising Israel with their biased reporting. Sky News, for example, decided to run this shocking headline on its homepage yesterday afternoon: “LIVE: Deaths as US embassy opens in Jerusalem”, deliberately intending on associating the fatalities to the US embassy move. This is clearly an attempt to paint the US decision as a problem rather than a solution. They are not the only ones, other media outlets are condemning Israel whilst looking away from the real crimes of Hamas. Israel’s Ambassador to the UK, Mark Regev, has been defending his country on the airwaves. The following recording is from his interview on BBC Radio 4. Let us join Ambassador Regev by adding our voices in defending Israel at this time. As this image illustrates, at the very core of this aggression is hatred for the Jewish people and a hatred for the Jews having their own state. We must not remain silent at this time. We must stand with Israel. And we must pray for the peace of Jerusalem.